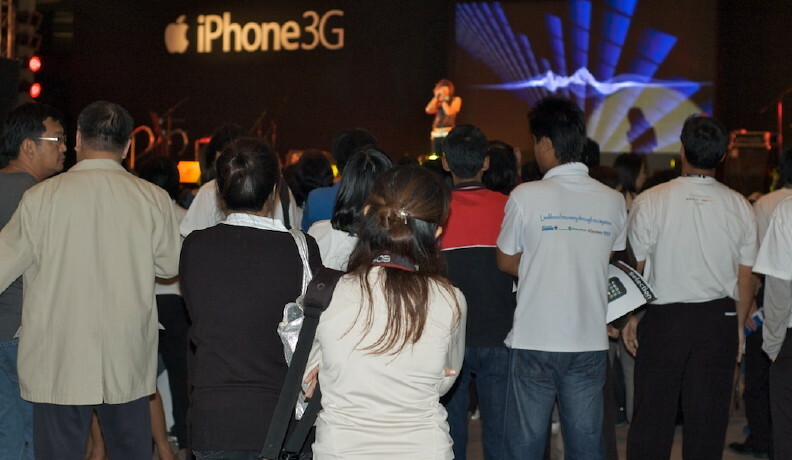 Yesterday (Friday 16 Jan 2009) saw, at long last, the roll out of the iPhone in Thailand, which is being handled solely, and entirely, by True, a subsidiary of the massive CP Corporation. 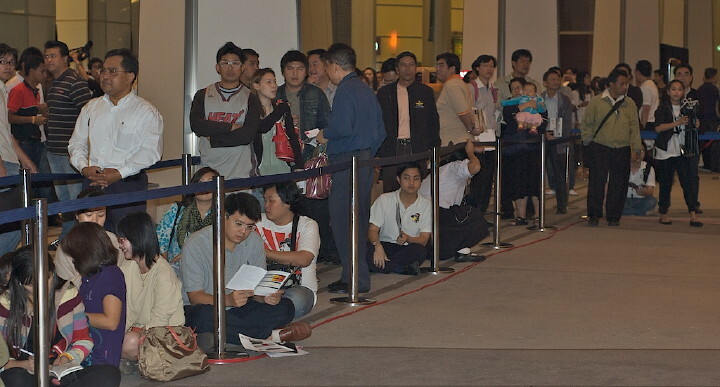 While the first users, who had pre-booked, were scheduled to get their hands on their devices starting from 7pm, there were a number of related events beginning at 5pm, although when I arrived at the Royal Paragon Hall on Floor 5 of the Siam Paragon shopping centre, the place was already packed out. Unlike Apple events, I did not have an invitation, but a few quick words with the organisers fixed that and I registered with the other media persons when the doors were opened. Owing to the large size of this hall which had been sectioned off for the event, and a dearth of signs in English, I found myself wandering around a little lost, but True personnel steered me in the right direction. On the way, I went into the room that was to be used for setting up the iPhones for the users, where several Apple management were and what must have been a couple of hundred tables all with disks and other items ready for the off. With two or three people to each table, the numbers that have been involved in recent months has clearly been high and in the main secrecy has been maintained. In Thailand that is quite an effort. After a quick hello to the Apple people I knew, I was steered to the seating for the press: rather uncomfortable stools and my back was still aching the next morning. While waiting for the start of the introduction, the press were handed a snack box with some tepid orange juice and a couple of pies (not too bad: I ate these while waiting for the bus later). I never understand why photographers here take photos or video of the other media personnel; and later there was a great rush to photograph the executives of True Move as they sat on their reserved stools. This is typical here, as is the media photographing or filming the media which totally misses the point. The focus should not be on the executives, but on the device or the people waiting (and willing) to spend their money to buy it. The wait gave me some time to think about what we had here. I was at the initial launch at MacWorld07 and the excitement was palpable. What is clear is the slight confusion and mystery that the third part -- a breakthrough internet device -- caused. Those assembled could not see the potential at that time. There are few devices that have caused such a stir and the release of the Phone shook up the mobile phone industry with all the manufacturers trying, one way or another, to duplicate what makes the iPhone what it is. Inevitably they, and the folks who bought unlocked iPhones, missed the essential ingredients (in the same way as MP3 player makers miss the integration with iTunes and the music store -- where available): an integration of hardware, software and services. True, for all its faults, does seem to grasp that point. That initial announcement of the iPhone in 2007 promised more to come and bit by bit the technology has evolved with web apps, then apps and the app store (the Thai app store has been online since July), and the 3G version which True is handling in Thailand: country number 99, although the list of countries has not yet been updated. 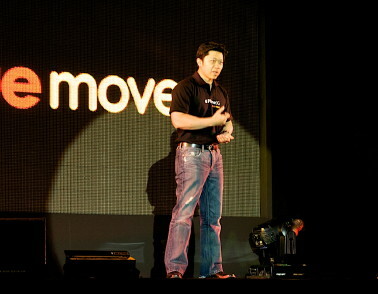 A presenter finally appeared on stage and introduced the first of the two to speak, Supachai Chearavanont who is chief executive officer and managing director of True Move (Dhanin Chearavanont is chief executive officer and managing director of the Charoen Phokpand Group who have a majority shareholding in True Move). He outlined the iPhone's arrival in Thailand and during much of his presentation (no notes and he knew the essence -- not relying on memory) pushed the idea of convergence and of the device as part of a "lifestyle". He mentioned the multi-use features which may not be familiar to many users -- phone, music player, games, pictures, internet -- and called it the top technology in the world. Perhaps a little hubristic, but he did not have to convince me. He also mentioned that True has its own apps for the iPhone. There are 12 currently available via the App Store and while some of these are specifically for the iPhone, some work on the iPod touch as well. Like the personnel already trained up for the introduction, this reveals that there has been a considerable amount of work going on behind the scenes. During his introduction, he took some time to thank Apple, which I guess is only fair, but as an indication of the fact that this is True's baby in Thailand, there was no one from Apple at this briefing or the subsequent question session away from the main hall. Apple personnel were there, but as advisers on the installation and were not openly involved in the project management itself. Khun Supachai also showed what appeared to be a couple of nicely made TV advertisements for the iPhone 3G with a Thai voice, but ending with the Apple logo. Not that I watch Thai TV that much (True is the main cable provider here too) and stick to the news, documentary and movie channels like BBC, HBO and National Geographic, but I have not seen these ads, so wonder if the cinemas might be the target for these. I don't go there either because of mobile phone use. Supachai gave way to Adiruth Thothaveesansuk, managing director, True Convergence, who sounds as if he is more the day to day project management guy. He examined more of the details of the iPhone's workings here discussing the availability of "Hi-Speed Internet" as well as the way Google Maps is incorporated into apps like Bangkok Attractions and the WiFi Hotspots finder (both iPhone only). 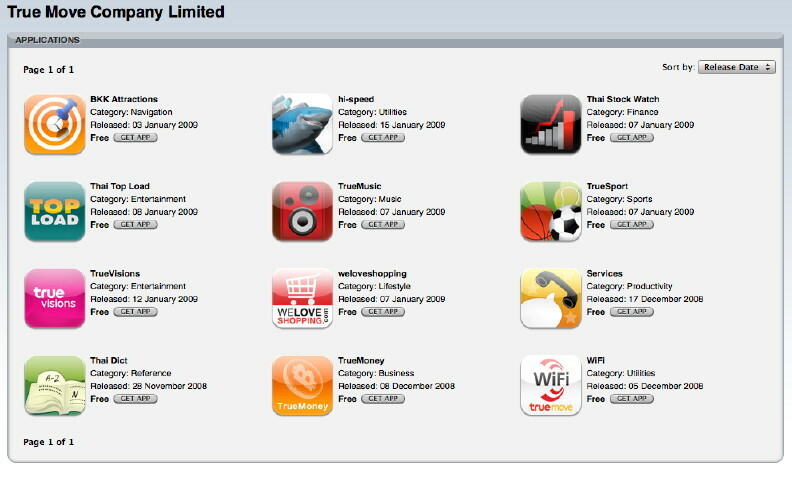 He took time to look at the apps that True has online and it is clear from this that True is recognising the value to them of added services that are going to bring in a continuing flow of cash. One of the points about a couple of the apps is that they link to True Visions content, so some of the copyright problems that bedevil online downloads here, including the lack of an iTunes Music Store, are unlikely to occur. The number of apps (12) plus those that users may already have, will mean a fair amount of access via the WiFi and other online services and, unless there is some self-discipline, we might look for some surprise bills. A press question time held in a VIP lounge away from the main events. 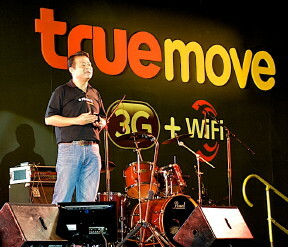 There was robust probing by some of the media in attendance and during this Supachai emphasised the commitment that True had to the iPhone 3G service. On the way, I saw that, while we were concentrating on the stage, the hall itself had filled and a lot of people were already in line for the first release that was due at 7pm. I have waited two years for the Thai release of the iPhone -- of course I could have bought an unlocked one in the interim -- and I am prepared to wait a little longer as the economics do not quite work for me right now. That line of purchasers bodes well for the service once some of the credit card sources are ironed out. There are a couple of ways that the iPhone may be acquired right now. In the last week or so a new opportunity was announced allowing True customers (that was not defined) to buy the iPhone for 23,275 baht ($667) and 27,075 baht ($776) for the 8G and 16G versions, plus VAT of 7%. With this method a user signs up for a year and pays 599 baht/month ($17). What is not on the site, but on the handout literature is a complete purchase of the phone, with no package for 24,500 or 28,500 baht (8G and 16G). That information is not on the web pages. The other way to get the iPhone in my sweaty little hands -- and this is what those lining up on Friday evening would have done -- is to sign up for a package: Silver, Gold or Platinum. All of these included the iPhone in the monthly payment plan over two years, each plan having a different level of service. A further package, the Bronze, was not available until the release and required some outlay for the phone (6,999 or $200 and 10,499 or $300 for the 8G and 16G phones respectively) plus a monthly fee over a two-year period. What tarnishes these packages for me is the problem that a user needs to sign up using a credit card (so that True has its income guaranteed) and with the way Thai banking regulations work, only Bangkok Bank or Kassikorn Thai (formerly Thai Farmers Bank) are currently accepted. I do not need another credit card at a time of economic crises worldwide. During the question time, someone raised the point that there was no Thai keyboard. I checked several times on Friday, but there was no update to the iPod touch firmware (this usually arrives in tandem with iPhone updates) so users are out of luck right now, which is a surprise and a problem, particularly with the way Thais make great use of the SMS facilities on their phones. While the iPhone and the touch can display Thai characters, it would be useful for locals to be able to type a reply in Thai as well. The executives were not wrong when they put that one at Apple's door and we hope that the development of this will arrive really soon. Back in the main hall, there was a party atmosphere as True had laid on performers and music; there were also a number of stalls round the hall selling accessories. 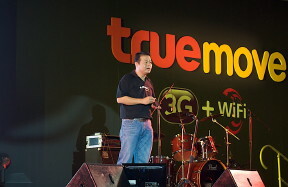 The whole effect gave me the impression that True has taken great steps to get this up and running, when 3G is still a problem in Thailand and True is keeping their fingers crossed that those who control the frequencies smile on them. Mind you, once that happens, they still have the chicken in the barrel attitude of the other operators: if one gets to the top, the others will try and drag it down. A slogan displayed early in the proceedings caught the intention: 1st to Move. Yes, but with tippy-toe steps.